These Saints were from the city of Edessa in Mesopotamia and flourished during the reign of Justin the Younger (565-578). After a pilgrimage to Jerusalem they were moved with a desire to forsake the world; they were tonsured monks by the Abbot Nicon, and soon after left the monastery to struggle together in the wilderness near the Dead Sea. When they had passed a little more than thirty years together in silence and prayer, Symeon, having reached the heights of dispassion, departed for Emesa in Syria, where he passed the rest of his life playing the fool, saving many souls from sin while hiding his sanctity with seemingly senseless behavior. He reposed in 570; by the providence of God, John, who had remained in the wilderness, departed soon after. With faith and love let us acclaim angelic and God-bearing Symeon who, though in the flesh, appeared as one without flesh and shone supernaturally with virtues; and with him let us praise renowned John, for they intercede with the Lord unceasingly for us all. 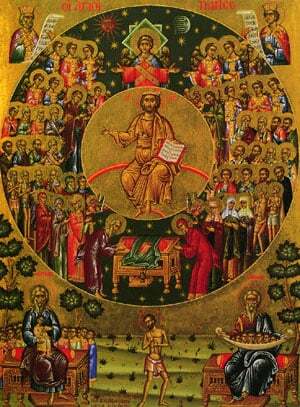 Share the feast of John and Symeon the Fool for Christ with an icon greeting ecard.